There are strategies that can help your children fluently subtract with larger numbers (to 1,000). These require an good understanding of place value and an ability to compose or decompose a 10 or a 100. 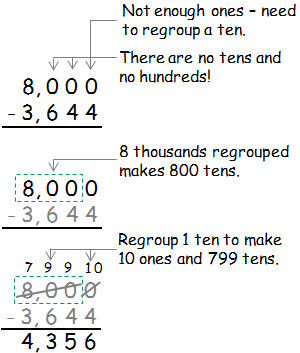 Help your child to understand the concept of regrouping when subtracting numbers. Work through the illustrated example to help with this. We use the base ten number system to write numbers with each place having a value; ones, tens, hundreds, thousands, and so on. When subtracting numbers we often have to split-up these groups to help us to do the subtraction. The example below shows this. Start with the ones. 2 - 7 can't be done. We're trying to take away more ones than we have. We need more ones! Let's take 1 of our tens and split it into 10 ones. We've now got 12 ones. We've also got 1 less ten. As shown in the example below, when there is a need to regroup, some students take the easy and incorrect option and simply subtract the smaller digit from the larger digit. This is a common error, especially when subtracting from multiples of 10 as shown above. Use this worksheet generator to set up lots of this type of question to provide practice with subtracting from multiples of 10. When students regroup they often find difficulty when "the neighbor is zero" and there appears to be nothing to regroup. This difficulty can be overcome by building on their understanding of place value. For example, the number 600 can be seen as zero 1s, zero 10s, and six 100s but it can also be seen as zero 1s and sixty 10s. This understanding, together with the boxing-off method shown in the examples below, will help your children when subtracting across zeros. 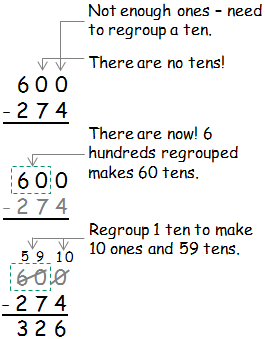 In both examples above, the steps required can be simplified by starting off subtracting 1 from each number. e.g. 599 - 273 and 7,999 - 3,643. Discuss with your children how, when thinking of subtraction as finding the difference between two numbers, this strategy works. You will find a good video on subtracting across zeros here . You will find some subtraction games here alongside some games on addition as well. The National Library of Virtual Manipulatives has many excellent resources including these Base Blocks Subtraction that you and your child can work with to help grasp the concept of whole number subtraction, including regrouping, with the base-ten number system. Read the instructions carefully to ensure you get maximum benefit from these very good resources.